Chances are, if you’ve knowingly navigated to an article called “the best men’s loafers”, you likely already know this, but just to cover over the basics we’ll ask anyway: what is a loafer? It’s a low, laceless shoe that exposes the ankle (time to buy some better socks), with a mocassin-like construction up top and a separate sole down below, usually with a little bit of a heel, which is what typically separates them from mocs. Some loafers are lower-profile than others and share a similar style to driving shoes, while at the higher-soled and sturdier end of the market loafers can get close to your classic office work shoe. Almost all loafers are leather - patent, natural or suede - and colours range from your classic browns and blacks, to blue, deep dark burgundies, and even a hit of gold if your the type to treat dress-down Friday like a fashion show. A few velvet versions have also been popping up in the shops of late, so if you prefer to style yourself as more of a Lord Byron-type figure, these are a tactile and luxurious option for a dandyish look. Alternatively, consider loafers with thoughtful finishing touches like tassels or Gucci-esque snaffle bits to take things from boardroom to bar with utter, enviable ease. If your heart says ‘boat shoe’ but your head said ‘work shoe’, why not meet in the middle with these smart tassel loafers by Magnanni? With personality and panache to spare, but with enough refinement that they wouldn’t look out of place in the average office, these suede loafers are a truly versatile pair. A narrow shape, fine suede construction and subtle stitching give them a sleek look, and the tone-on-tone navy makes a really nice change from black for everyday. For style points and wear-anywhere factor, these take our top spot. Follow in the high-end footsteps of countless Wall Street brokers, legacy Ivy Leaguers and Sloane Rangers with these equestrian-inspired loafers. A preppier take (yes, it’s possible) on the original leather horsebit loafer that burst onto the scene some sixty years ago, this suede version takes that standout hardware, the snaffle bit, and puts it at the forefront of taut, neat navy suede. With a sleek almond toe and little in the way of texture except for a Ralph Lauren-esque contrast ribbon across the vamp, these are investment loafers that speak for themselves, great sockless in summer or at the office. These Weejuns (after Norwegians) by GH Bass are the ultimate embodiment of prep school alumnus chic. The slight square-off at the toe retains that classic penny loafer look while looking a little dressier than a more distinct square, the moc-like stitching and tell-tale cutout vape are neat and refined, and the polished leather finish takes things up a notch. For that all-important meeting, or if you’re just the kind of man who likes to bring his fashion A-game every day, add these to your wardrobe to nail that tricky business casual code. Heck, why not get one in every colour? It’s not every day men get the choice of anything in more than two colours, so go nuts. From the sublimely simple to the borderline bonkers, these embellished loafers from House of Hounds are quite the nifty choice if you’re looking to make a statement with your outfit. The collection’s aim to blend “authentic shapes with contemporary trends” is fully evident in this swanky shoe, in its simple lines, piped collar and narrow streamlined shape characteristic of a classic loafer, and of-the-moment additions like a patterned embossed upper and contrasting tassels. 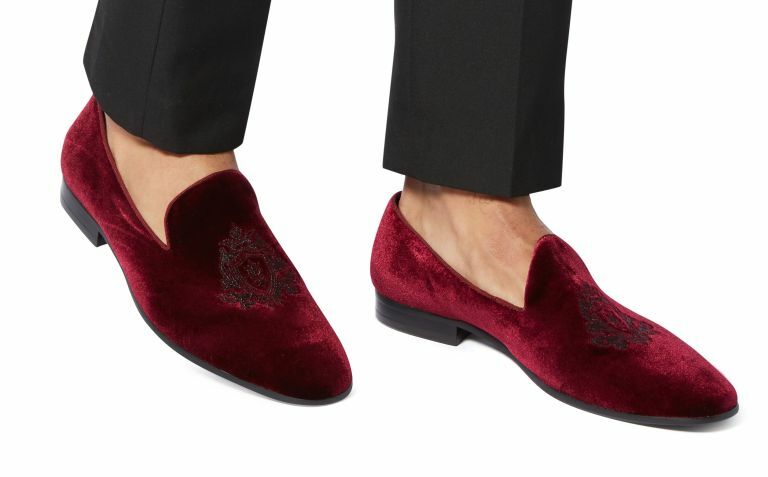 For the man who wants to give that “I’ve only turned up to your party because my butler is on annual leave and there’s nothing in the pantry” vibe, these slipper loafers are it. Plush velvet with an opulent sheen, saturated jewel tones for richness, and all of that topped off with a crest embroidered in gold threat – that’s right, a crest. With a look that’s luxurious and a little louche, these loafers offset a little bit of the potential fussiness with a sleek slipper shape, making them surprisingly acceptable for semi-formal occasions. Summer events can be incredibly difficult to dress for (unless that event happens to be a water fight or mate’s barbeque, in which case we’ve typically got it licked), but a light-coloured loafer is always a good choice. With their moccasin-like construction, these loafers could run the risk of looking a little too laid-back, but the tone-on-tone stitching, traditional penny loafer design with distinctive cutout on the vape, and sleek one-part sole with low block heel bring it back to the realms of the refined. We especially love the choice of milky taupe or French navy, a nice change from brown and black that makes these our best loafers for summer. What Tod’s has done in creating these loafers is take its iconic suede driving shoes and give them a sturdier sole to turn occasional shoes into comfier everyday wear. Handmade in Italy, these low-profile shoes are offered in black, brown and blue and have a moccasin-like construction. The toes have been oiled to make them look worn in, giving the shoes an interesting patina that is at odds with the box-fresh shininess of most new footwear. These suede loafers from Polo Ralph Lauren also resemble a driving shoe in their design, with a low-profile leather sole paired to light tan suede upper. There’s some nice detailing on the tongue and toe, while a subtle Polo logo hangs from the side. A great-looking summer shoe, you’ll want to get the most out of these while the sun still shines, as their suede finish and lighter colour could prove tricky to keep clean when the weather inevitably turns. These leather loafers by Berluti are hand-crafted in Italy and dyed using techniques passed down by generations of shoemakers since the 19th century. They are made from kangaroo leather, which is known for its suppleness and lightweight feel, while the tan finish gives them classic good looks that go with almost anything. Yes, they are rather pricey for a pair of shoes, but we’re sure your feet deserve it. These tan coloured suede loafers by Bertie Parason strike a balance between office sensibility and night-out style. They have a round toe design with suede upper, rubber sole and leather inner. The classic apron stitching and tan finish is jazzed up with a metal snaffle detail. For a more refined, meeting-friendly look, these loafers are also available in black leather with a leather-look rubber sole and a more subdued silver snaffle. Fashioning themselves less after the favoured house shoes of the unbearably rich and more after the original Norwegian design, these Aldo loafers are sleek, simple and sophisticated. In a choice of black and chestnut brown satin-finish leather, they feature just the right amount of stitching and burnishing (that’s that subtle darkening of the leather at the toe, to us civilians) to add interest while staying as low-key as possible. Arguably the ideal low-key yet smart shoe for day and night.